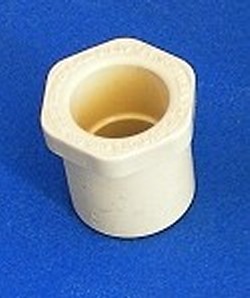 Reducer Bushing 1/2" sch 40 to 1/2" CPVC CTS (Copper Tube Size, the almond colored plastic pvc pipe). This is the bushing you would use if you want to use 1/2" CPVC CTS plastic pipe with any of our 3 ways (413-005), 4 ways (426-005), 5 ways (425-005) or 6 ways (486-005) and any other 1/2" sch 40 fitting. Made in the U.S.A.